You know me- I have a major affinity for early American knife company memorabilia and one came my way last week. And while I did buy it, the truth is I am only its custodian for a while. Hopefully, down the road someone else will become its caretaker preserving it for future generations. What is it? It’s a rare postcard depicting The Big Four– John. D. Case and his three sons of Case Cutlery Company of Kane, Pa. The history of Case Cutlery Co. Kane, Pa is very interesting. This picture and the firm’s history is contained in Brad Lockwood’s The Case Cutlery Dynasty. 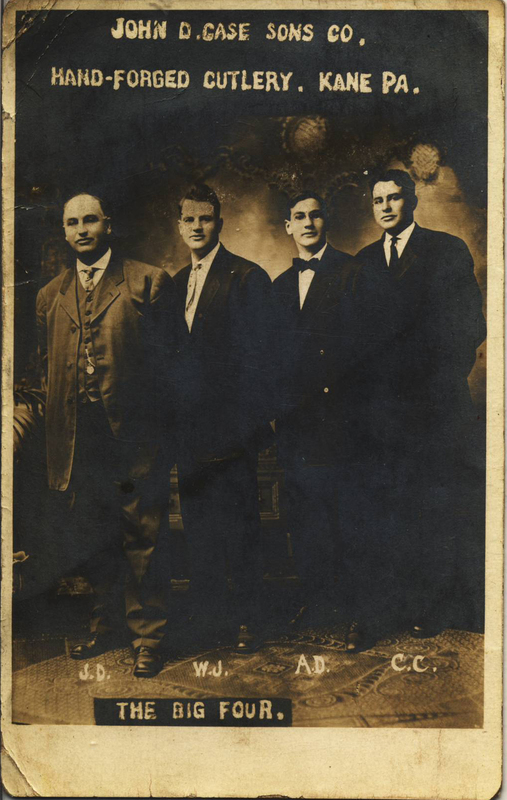 There Brad reports on July 14th, 1908, John Case and this three sons- The Big Four– broke ground on the new Case Cutlery Company factory in West Kane. That was the exact same day, incidentally, of the foreclosure sale the neighboring factory of the Case Brothers Cutlery Company. Life happens. Most of the time it is a good thing, but sometimes it can interfere with other things we want to do. That’s what is happening to me right now. Got lots of “Knife Things” I want to be doing, but priorities, well they take priority- things like WORK, family, kid’s sporting events, situations, etc., can and do cause us to need to focus on them. The end result of this is setting fun projects aside until the time is right- such is the situation for iKnife Magazine- one of my Knife Things I wanted to have rolled out by now. So, for you who are waiting on me to launch iKM- I’ve had to set it aside for the time being. I hope I can pick it back up in the next few months. For now though, I’d like to invite you to visit iKnife Collector for good knife conversation and topics. I expect to resume posting here at CNJ as often as I can, but for the same reasons, might not be able to post here with the same frequency I have over the last year. Please feel free to stick your head in over at iKnifeCollector. I’ll probably be there when you do. If not, then don’t hesitate to drop me a note to let me know you stopped by.